Residence is a lot more than a place to sleep. For Wilfrid Laurier University first-year students in the Film and Media Residence Learning Community (RLC) on the Waterloo campus, it’s also a place where they can bond with others who share a common interest and take part in enhanced learning experiences ranging from film screenings to chances to make their own movies. 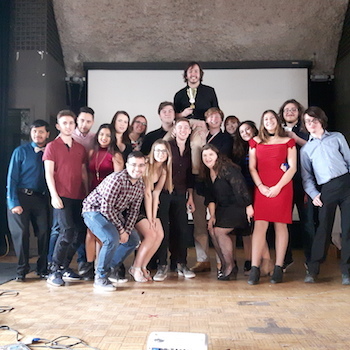 The Film and Media RLC won the Waterloo College Hall Community of the Year Award in March and now the Film Studies faculty members of the Department of English and Film Studies have won the winter 2018 Residence Academic Partnership Award. The award is presented each fall and winter term to members of the Laurier community who help support the advancement of academic initiatives in residence. Typically, the award has been presented to one person per term. The fall 2017 award went to Associate Professor Ken Jackson for his work with the Business and Economics RLC. However, the winter 2018 award went to all Film Studies faculty “because of the way they worked together to support the Film and Media RLC,” says Melissa Pratt, residence coordinator of academic initiatives. “The film professors have been excellent and having them come in to discuss film courses and material added to my success in and passion for the course. It really meant a lot for them to do that, as I know they are busy people,” says first-year student Victor Cannell. "The Laurier film professors are a group of incredible people great at teaching and always a joy to talk to," says fellow Film and Media RLC member Matt McKenzie. “I appreciate the effort that they put into getting to know us and that it made me know that I made the right choice for my major,” says Adrianna Pater, also a member of the community. About 300 first-year students lived in eight RLCs on the Waterloo campus in the 2017/18 academic year, of whom 22 were in the Film and Media RLC. There were also two RLCs on Laurier’s Brantford campus, plus three Learning Clusters, in which students don’t necessarily live on the same floor but meet throughout the year for themed programming. RLCs and Learning Clusters are part of the Department of Residence’s Living-Learning Program. Both types of residence communities feature experiential learning opportunities to enhance classroom-based studies. These may be led by the don, by faculty or by staff members.